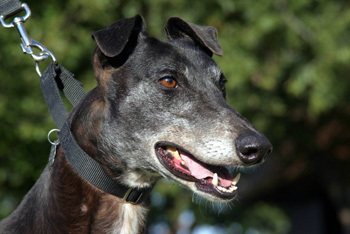 Olive, aka B Mac's Olive, is a beautiful, 5-year-old black female born October 16, 2002. Her sire is Unruly Thomas and her dam is B Mac's Lucille. 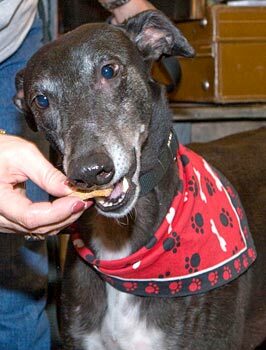 Olive's racing career of 74 races started Jun 19, 2004 at Caliente, Mexico, and finished June 24, 2006 at the Phoenix, AZ track, as a Grade AA racer. Olive is ready to race into her forever home for sure! Olive is not cat tolerant and has not been close to small dogs yet. As of Thanksgiving, Olive has been in my home for about two weeks; she is proving to be very sweet, loving, and an outgoing girl. She is beginning to understand just how good life can be off the track. She loves attention, big fluffy beds, and has recently found the furry dog toy box. 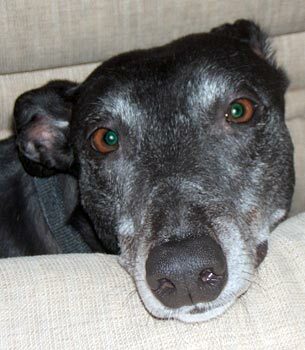 She is still learning what home life is about – she is crate trained and loving the fact that someone cares. 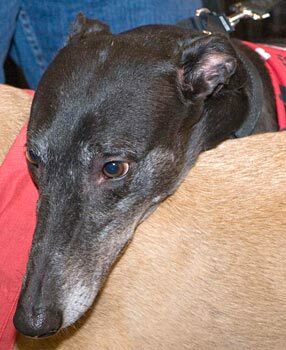 She's a big girl and doesn't understand just how strong she is, but she is settling down and would be fine going to a home where she gets all the attention, or she would concede to sharing as long as they are buddies close to her size. She has not been tested to see if she is tolerant of smaller animals. 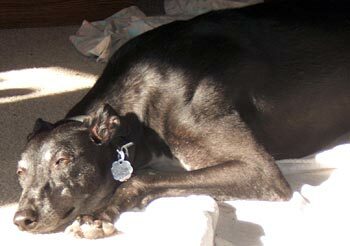 Like most Greyhounds, she is focused on small furry animals and loves chasing them outside.